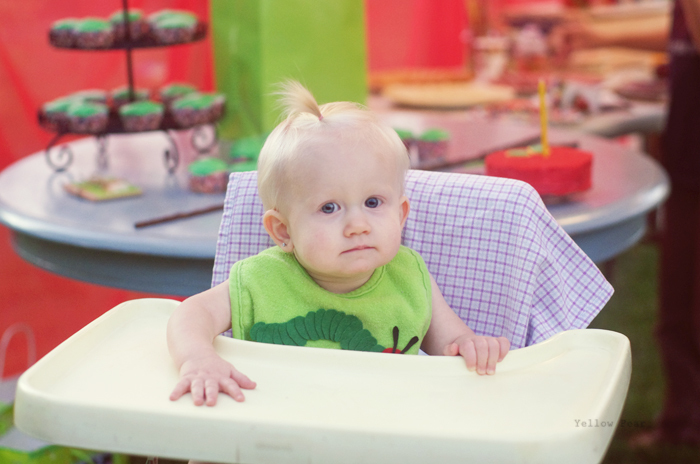 My niece had her first birthday and I was there to attend the party. Yay! I usually miss everything. 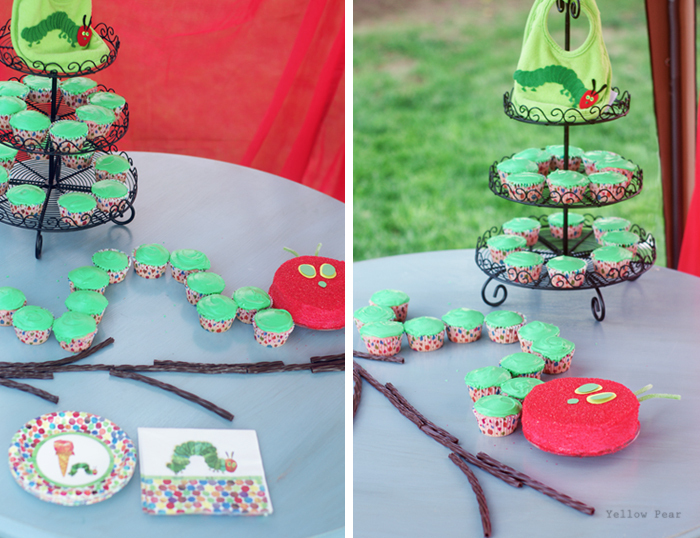 My sister and I had earlier discussed a party inspired by "The Very Hungry Caterpillar" book by Eric Carle. 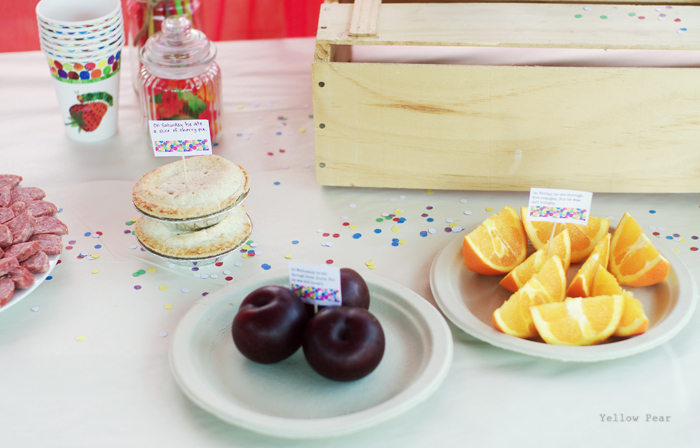 It is such a fun and colorful book with so many food items...it was begging for a party theme. Luckily I was in town and so I got to help, which is my favorite part. We only had half a day to pull it together, but there were a lot of us working together. We used lots of circles and colors as inspired by the book. 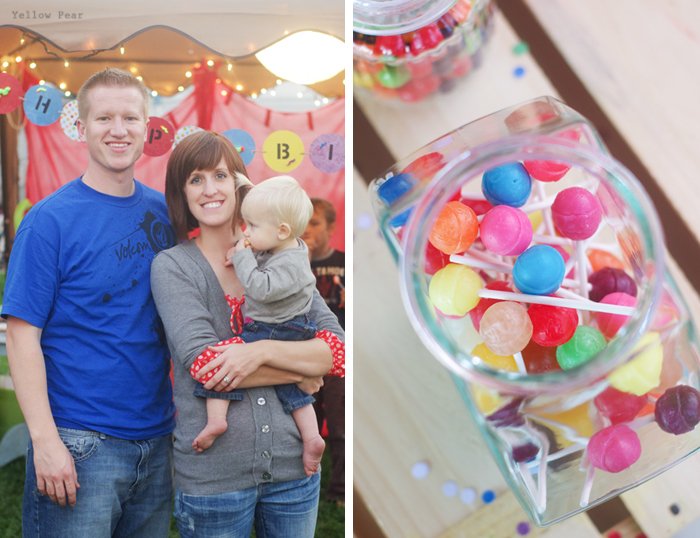 Dum dums, gobstoppers and gummy worms were displayed in jars (and I thought the kids might die of anticipation as we waited for the party to start). Most of the party food was eaten by the caterpillar in the book and although I would have loved to have displayed each and EVERY food item mentioned in the story, that gets a bit pricey and over the top...so I tried to hold myself back as, after all, there were not going to be THAT many guests! 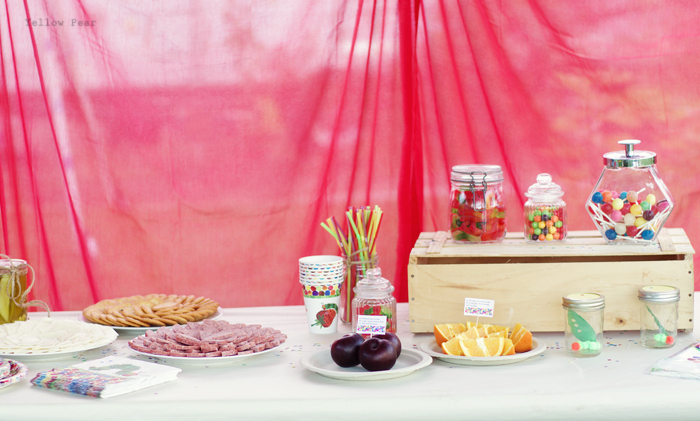 We also served giant mason jars full of very brightly colored Kool-aid...but I forgot to snag a picture. Imagine them in that empty spot between the cups and the crackers. My brother-in-law stenciled the letters on the banner and decided we should make miniature caterpillars to stick to it. So clever. Also, after we hung the banner and because of the circular shape, the letters kept twisting this way and that. Quick as a wink, he decided that pennies taped to the back would fix the problem. He was absolutely right. Genius and handy. He also cut and arranged the summer sausage, cheese and cracker plates in the most delightsome and wonderful patterns. ...and, AND hand punched the confetti after we decided it would be a very nice touch. He suffered from hand cramps after. 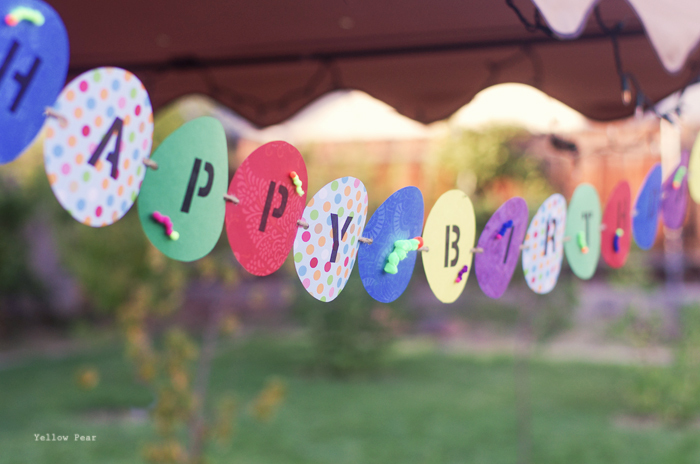 What a great confetti-punching, cracker-arranging, penny-taping dad. We used my dad's beautiful homemade pickles as part of the decoration and the food because the caterpillar ate through a pickle on Saturday (in case you aren't familiar with the story). 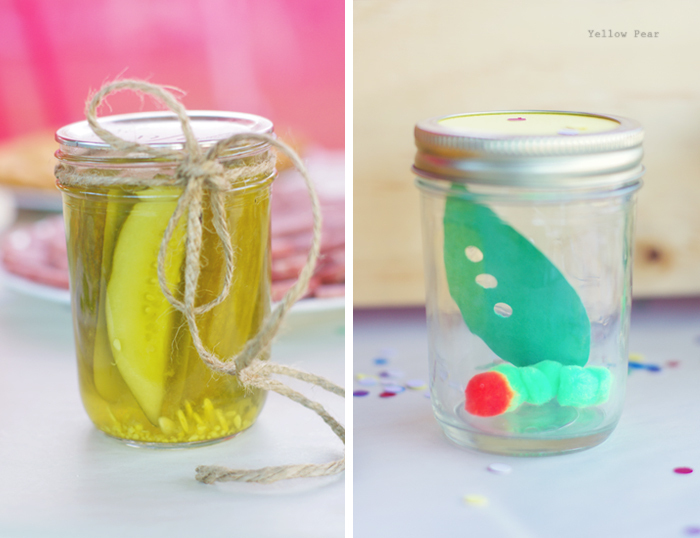 We also made pompom caterpillars and put them in jelly jars along with a partially "eaten" leaf to put on the tables. We almost forgot the cherry pies...so I had to get another photo with the cherry pies included. We wouldn't want them to feel left out. 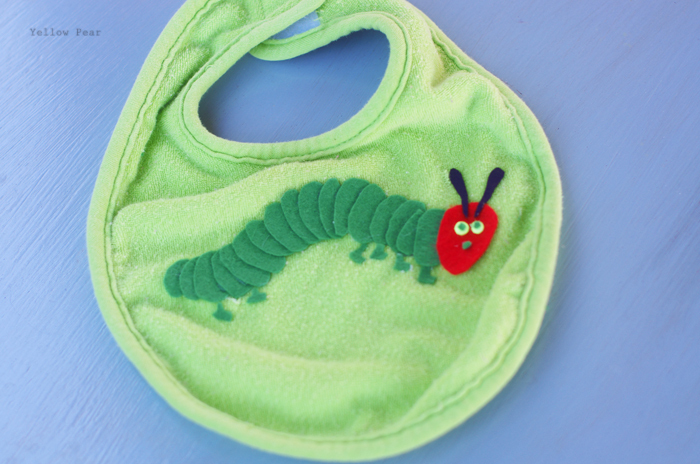 My sister had wanted to make a bib, and so as she was slaving away all day directing, cleaning, answering questions and trying to make labels for the food and having a difficult time on an unfamiliar program and computer...I hurried and hot-glued a felt caterpillar on her existing green bib. Miss B made the cupcakes and frosting (with some help because she got distracted) and then she and I decorated the cake. We couldn't get the frosting red enough with the grocery store food coloring we had, so luckily we found some red sprinkles in the cupboard and covered the "head" of the caterpillar with the sprinkles, making it beautifully red and sparkly (which is always a plus). My sister had the genius idea to use chocolate licorice as a branch. We used Sour Green Apple Straws for the antennae and made the eyes and nose out of paper. Oh and take note of the bib on top of the cupcake stand. My sister and I couldn't for the life of us decide where to display the bib. We tried this and that but nothing was working. In the midst of our indecision, Miss B walked over and started rearranging cupcakes. We tried to shoo her away like we were telling the rest of the rugrats,but she was like...just wait...and she took the cupcakes off the top tier and squished them on the bottom two (which was good because it was quite sparse) and then hung the bib from the top. Sometimes she blows me away. She is so good at stuff like that. 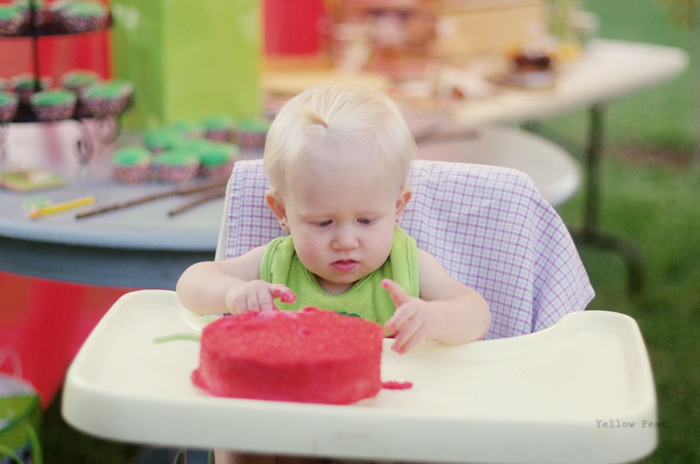 The party girl was delightful and adorable and decided she did in fact like her cake, even if it took a few minutes of poking and licking to come to that very tasty conclusion. It was such a fun day hanging out and planning and making and chatting and laughing. Oh and eating too. 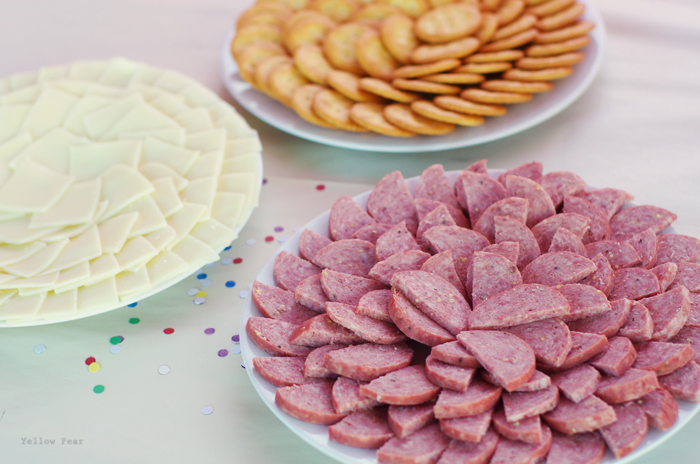 I love, LOVE summer sausages with crackers and cheese. Oh boy. Yum. Brother-in-law or cousin-in-law? :) Turned out great! I already recruited Marci to help with Kendall's. Love the creativity you guys come up with! Too cute! Love the cupcake catterpillar! 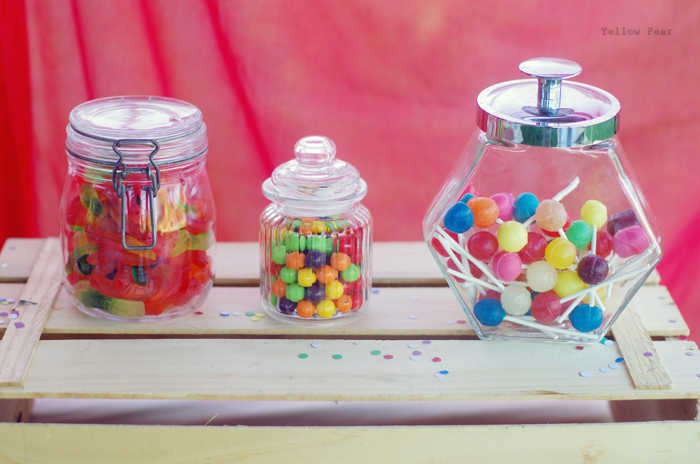 Is that a jar of unwrapped dum dums? It looks adorable!